Our &#34;Veggie Confetties &#34; (AKA Micro-Greens) are exclusive blends developed right here in Wethersfield. 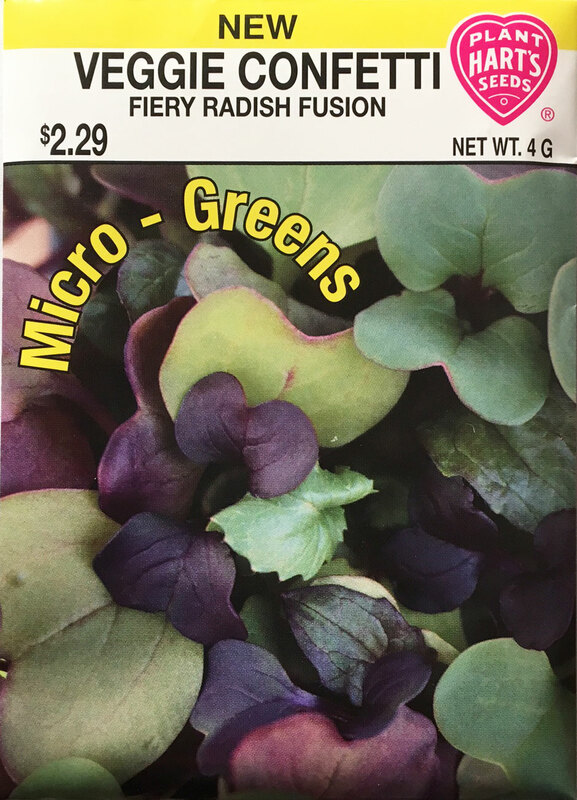 This unique blends of Sango radish (purple leaved/purple stem), Red Arrow radish (pale green leaved/pink stem), Triton radish (dark green leaved/pale purple stem) and our exclusive Kaleidoscope Mix radish give you the best possible mixture of colors and spicy tastes. Easy to grow indoors or out, any time of the year. These nutritious stems and leaves are not sprouts; the seeds are planted in soil and harvested when the seed leaves appear. Studies suggest micro-greens contain at least 7 times the nutrient density of their mature vegetable counterpart. Planting time - preferred method - outside in the cool season. Sow seeds as soon as the ground can be worked in the spring or late summer for a fall/winter crop. Germinates in - 5-7 days depending on the soil and weather conditions. Seed spacing - very close tougher - seed to seed, scattered or in rows. Thinning - none needed. Just cut the baby plants at the soil when about 2 inches tall and enjoy!